This is for my HR Manager who is leaving the company. 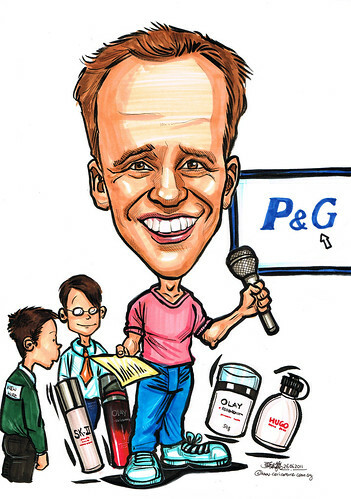 We want Pete to be a BIG HEAD, BIG SMILE holding a BIG MICROPHONE as he usually lead in our monthly Townhall sessions. In a PINK SHIRT with a pair of JEANS on. To show Pete looking at a powerpoint slide (a piece of scribble paper – may photo) with new hires and we would like a range of our products like fragrances, SK-II and Olay around him. He handles fragrances, SK-II, Olay, etc"
The first attachment is a sketch from my boss for Patricia. Patricia with a BRIGHT SMILE in a CHINESE COSTUME on top of the maps of CHINA, HONG KONG, TAIWAN (she will be relocating to China). 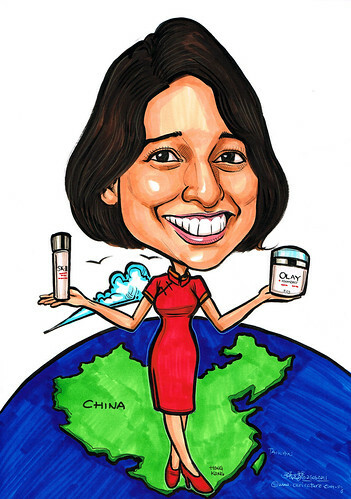 On both her hands, we would like her holding a bottle of SK-II on her right hand and Olay on her left hand just above her shoulder."